The WorkForce Pro WF-6590 letter/legal-size multifunction printer, powered by PrecisionCore®, saves up to 50 percent on printing costs vs. color lasers1. Minimize downtime with Epson's highest-yield cartridges, which print up to 7000 black/color pages2 before replacement, and a paper capacity up to 1580 sheets3. 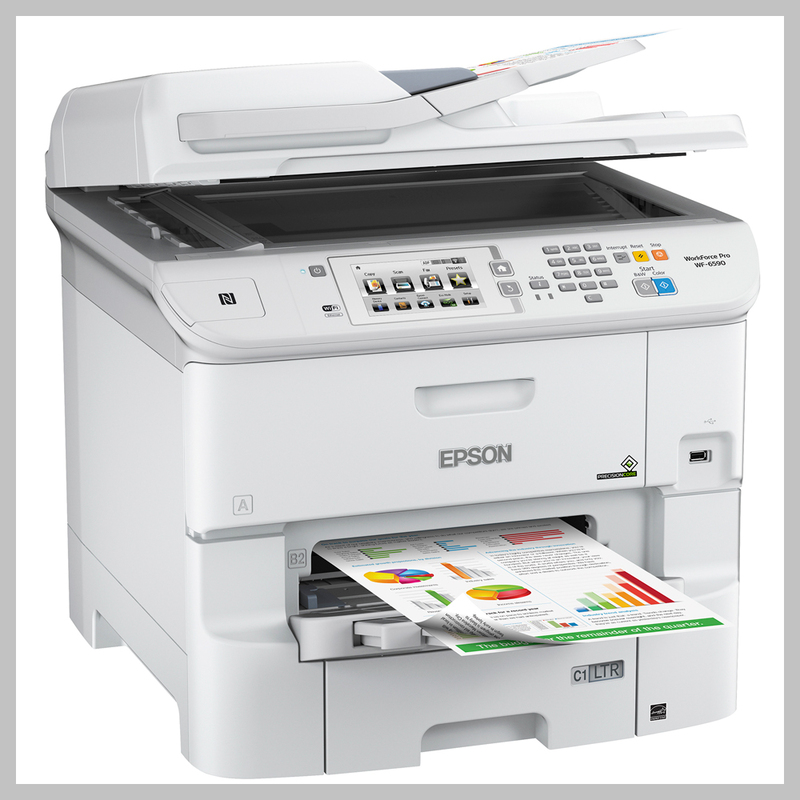 Epson's fastest office multifunction printer, the WF-6590 delivers pro-quality documents as fast as 24 ISO ppm (black/color) . Fast auto-duplex printing, scanning, copying and faxing saves time and improves workflow. IT tools and security features make network integration seamless for shared printing. And, it's enabled with remote data collection compatible with leading third-party MPS software solutions4. 1 Compared with best-selling color lasers priced at $600 (USD) or less as of May 2015. Calculation based on continuous printing with highest-capacity cartridges. Actual savings will vary based on print task and use conditions. 3 With optional paper trays. 4 Including PrintFleet, ECi (FMAudit) and Print Audit. 5 Not all media types are supported for PCL printing. 6 Monthly duty cycle up to 75,000 is the highest duty a user could expect in a month, based on near-constant operation of a device of this kind. It is not recommended that the device be run at this duty. For best device performance, run the device at the recommended duty of 5000 pages per month. 7 Compared to best-selling color lasers priced at $600 (USD) or less as of May 2015. Actual power savings will vary by product model and usage. Purchase an Epson Workforce Pro printer by April 30, 2019, and receive an instant rebate up to $200.00 (our website price reflects this discount). For a listing of items eligible for this offer, please click this link. Offers valid though April 30, 2019, and are limited to stock on hand.